Parents who battle their children each morning and night in the tooth brushing war may have some relief. 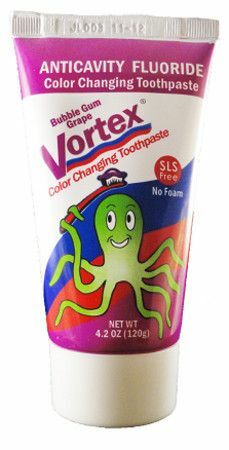 St. Louis dentist, inventor and retired Chaminade chemistry teacher Dr. Howard Wright has invented Vortex, the world's first color-changing toothpaste. Wright, who graduated from the Washington University School of Dental Medicine and who has lived in Sunset Hills for 15 years, released the first tubes of Vortex in early November. He hopes that the color-changing process, from red and blue to purple, will make kids want to brush their teeth longer and more vigorously. Kids from the Hazelwood Community Center Tiny Tots program were the first to try the FDA-approved Vortex at the Delta Dental Health Theater. The red and blue toothpaste is dispensed as twin streams that change into purple as the child brushes. The invention, which has been in development for 10 years, is a true delight according to Wright. Eating fish may keep the brain healthy and reduce the risk of Alzheimer's disease, a new study says. In the study, people who ate baked or broiled fish at least once a week had larger volumes of gray matter in areas of the brain known to be involved in memory and learning. Moreover, people with larger volumes in these areas reduced the risk of developing Alzheimer's disease five-fold over a five year period. People who ate fried fish, on the other hand, did not gain protection against Alzheimer's. The findings suggest lifestyle choices can ward off Alzheimer's disease, said study researcher Dr. Cyrus Raji, of the University of Pittsburgh School of Medicine. While other research has linked fish consumption to a lower risk of Alzheimer's disease, the study is the first to examine the effect of eating fish on the actual structure of the brain, Raji said. The study was presented today (Nov. 30) at the Radiological Society of North America annual meeting in Chicago. Computerized testing to evaluate concussions among high school athletes appears to be on the rise, with an impact on return to play, national injury surveillance data indicated. Among high schools that employed at least one athletic trainer, 39.9% reported using computerized neurocognitive testing from 2009 to 2010, William P. Meehan, III, MD, of the Sports Concussion Clinic at Children's Hospital Boston, and colleagues found. The proportion of student concussions evaluated with computerized testing reached 41.2% that year, they reported in the January issue of Pediatrics. That was up from 25.7% in the prior school year, as the group previously reported from the same High School Reporting Information Online injury surveillance system. "Given the flurry of media attention devoted to sport-related concussions in the last several years, this number is likely to continue to increase," Meehan and colleagues wrote. That shift has had an impact on students, with the study showing a delay in return to sports. With computerized neurocognitive testing, the proportion of concussed kids who returned to play within 10 days of their injury was 38.5% compared with 55.7% at schools not using the testing. But that may be appropriate, according to a second study reported in the same issue of Pediatrics. Lipitor goes generic tomorrow, and we know you have a lot of questions about how that will affect your prescription. Many readers wanted to know whether they'd get the name-brand or the generic version (atorvastatin calcium) when next they filled a prescription. The short answer: you won t know until you get to the pharmacy.